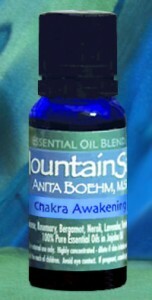 Chakra Awakening ™ essential oil blend differs from the Microcosmic Orbit with Bergamot replacing Myrrh for the throat chakra because it also accesses the heart chakra –allowing one to speak their truth from a place of compassion & unconditional love &, Vetiver replacing Ylang Ylang for the sacral chakra — drawing greater depth toward our creative “place of self “ (literal meaning of this chakra) because it represents nothing less than spiritual immanence – i.e., total presence of Spirit in a material world”(Peter Holm, 2001). As a result, Chakra Awakening is formulated, specifically, to circulate through the 7 primary chakras & aid in opening (awakening) & balancing the emotions associated with the chakra/central nervous system. This blend also enhances meditation, breath work & other practices that enhance health & well-being. Chakra Awakening is highly concentrated with 100% pure therapeutic essential oils of Frankincense, Rosemary, Bergamot, Neroli, Lavender, Vetiver & Cedarwood in a Jojoba oil base. For best meditation results, place the oil blend directly beneath your nose. If skin irritation occurs, dilute further in any additional base oil (more jojoba, grapeseed, etc.). Discontinue use if irritation persists. Oils may also be added to a diffuser, bath, or for general massage when further diluted.